Please call me today and let's talk about how your web site can do all of this and increase your sales. Click any petal for more information on that area. Web site for Transplant Nursery, Inc.
Includes a slideshow on each page showcasing the plants offered by Jeff and Lisa; separate pages for collections like Endless Summer, Maid in the Shade, Plant Introductions and Southern Living Plants as well as new introductions; current availabilty with photos;and a gallery of Lisa's photos. 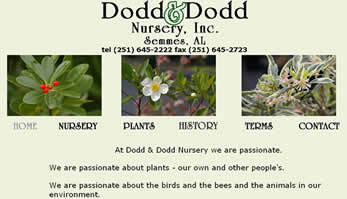 Web site for Dodd and Dodd Nursery, Inc. Includes Thayer's outstanding photos showcased in a separate gallery and Tom's incomparable notes for every plant. Plants are searchable by various criteria - natives, D&D introductions, height, flower color, cultural requirements and more. A current availability, current speaking engagements, and media mentions are all included. 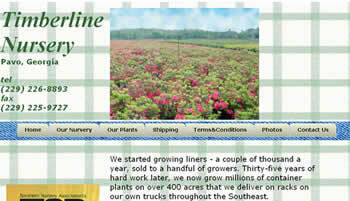 Web site for Timberline Nursery. Includes an interactive availability and photo gallery of plants that makes it easier for customers to see what plants are available and how great they look. Web site for Hull's Treeland . Includes interactive photos, an availability and a gallery of Selby and Patti's great trees and rootballs. G&S Trees, located in North Carolina, grows container plants, B&B trees and Fraser Fir Christmas trees. 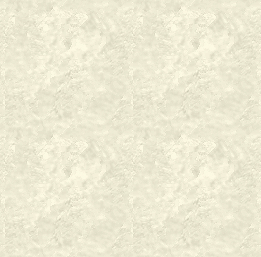 Click on any image to go directly to that site. Site design and maintenance for the Georgia Master Naturalist Program, NW Chapter. the world's first sterile triploid Bermudagrass that will grow in 70% shade! For The Turfgrass Group. 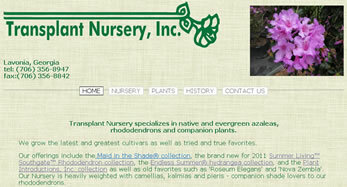 Inc.
Site design and maintenance donated to the Georgia Ornamental Horticulture Commission. Site design and maintenance for the West Georgia Green Association. 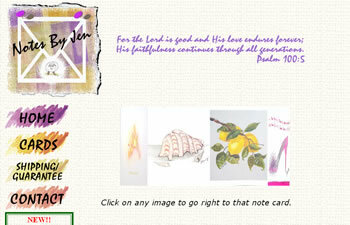 Web site for Notes by Jen featuring printed note cards with a Christian theme from the artworks of Jennifer Kenney. There are three levels of detail close-ups showing the brush and pencil strokes of Jennifer's art and full e-commerce capabilities. 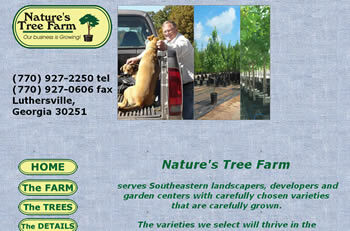 Web site for Nature's Tree Farm. Includes interactive photos at the tops of the pages, an interactive availability and a gallery of Steve's terrific trees. 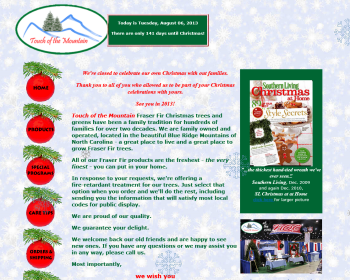 Web site for Touch of the Mountain, Inc. Includes falling snow, music, countdown to Christmas and full e-commerce. This was picked up by a New York TImes columnist ("Who Knew?" December 7, 2006, p.D3) and resulted in a sales increase of about 25% over the previous year. This was picked up by Southern Living and featured in the December, 2009 issue.